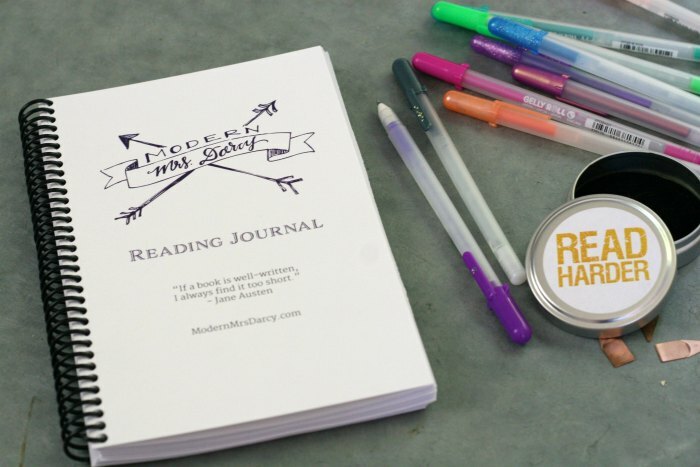 The MMD printable reading journal. As a rule, I’d rather be reading than recording what I’m reading. But I do it anyway, because I love having a record of what I’ve read, and what I want to read. There are great reading journals on the market (this is my favorite), but ready-made journals lack flexibility. Blank books are nice, but some of you (and that includes me) need a template to get started. 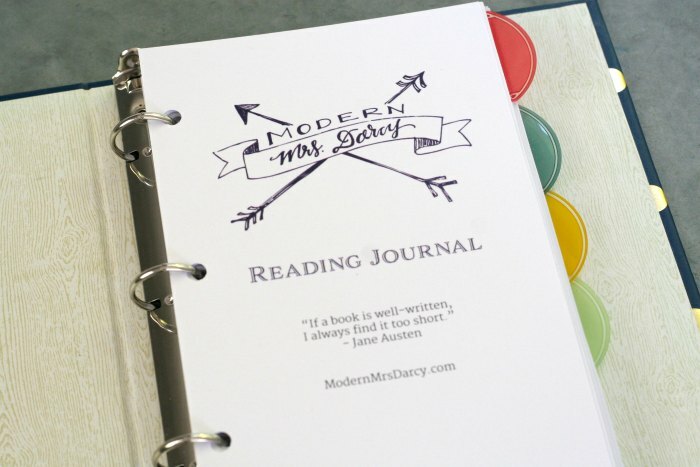 That’s why I’m delighted to introduce the printable MMD reading journal. This journal is designed to be flexible. (Hat tip to Lauren of Santa Clara Designs who worked hard to make it easy to use.) Print all the pages, or just the ones that interest you. 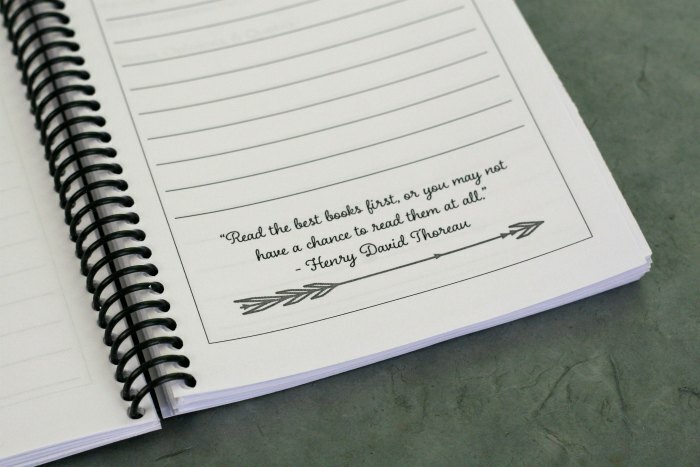 Print as many or as few book entry pages as you desire. If you love to take notes print plenty of notes pages. 1. Check your inbox. The journal is free to all subscribers (blog or newsletter). All current subscribers should have a journal ready and waiting for them. Not a subscriber? Sign up here. 3. Print the journal (or selected pages, as you choose). The PDF is designed for single-sided printing. The cover page is in color (it’s not necessary to print it in color, but it sure is pretty); the rest is black and white. I’m looking forward to hearing your feedback on this Journal 1.0 project. Thanks for subscribing, using, and sharing! Wow, I’m quite impressed! It is clear that this was a labor of love for you. Can’t wait to print and put it to use! Thank you so much! Wonderful!! Cant wait to print this off and start using my reading journal. A reading journal! What a brilliant idea. I am eager to get it bound so I can begin using it. This is fantastic. I too like Goodreads but I also write my books down in a notebook and have for years. This is much more ‘classy’!! I have got more good recommendations for books from your site than any other ever! Love it! I am terrible about following through on projects, but I really want to get this printed out soon! I’ve only started tracking my reading in the last two years. I think it will be interesting to look back not only on the title I’ve read but also what I thought about the book at the time I finished it. Thank you for putting this together! Thank you for this! I am going to try this. I’ve never done this before. I’m afraid to try because I don’t want to quit halfway through! But I think it is a great start at writing better book reviews, too. Again, I would love your tips on that! Plus… I love the new design of your site! It is really great. Cozy and creative. Love it! Have a great day! Oh my goodness, this is fantastic!! Can’t wait to print it off and start using it. I’m excited to start using this. 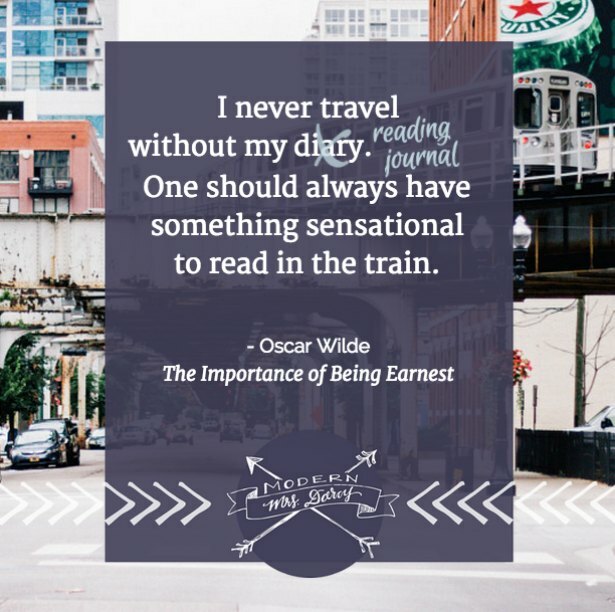 I also like good reads, but have never journaled about what I’m reading. I think this will be a great help, especially for books that I really liked and want to marinate on some ideas. Also – I totally get sucked in by the Internet instead of reading the book I intended too. I think that’s a big reason why Kindles continue to be so popular for just reading books. I am SO excited to download this and keep it on hand. Thank you for creating such a lovely aid for avid readers. I, too, appreciate paper and pen over electronics. As much as I love Goodreads, I’m anxious to use this journal. This is so great! This may be my favorite week of the year– The Summer Reading Guide AND a beautiful Book Journal–so much goodness in one week! Thank you for this and your lovely blog! Thanks so much! This looks wonderful. You are so clever! What a great gift to your readers. I’ve kept the same reading journal since 2004. Love it. Wow! What a lovely over-the-top gift to give us readers, Anne! Wow! Anne, thank you so much for this gift! You are brilliant. Thanks so much for this wonderful journal, Anne! So many times I’ve wished I’d kept better track of the books I’ve read over the years and this will help. I especially like all the book lists you’ve included for when I’m stuck for something to read! I love that you have an abandoned books page! Good reads needs a setting for this. In Goodreads, you can mark a book “didn’t finish”. I’d say that’s the same as abandoned! It still stays in your “currently reading” list though, unless you move it to “to read” or “read” neither of which are what I’d want. Good point Tory. I joined Goodreads for the recommendations and have been disappointed with them. I add my books but I still keep a list in a note book. Isn’t this journal great?? Thank you so much. What a thoughtful gesture and great gift for your blog readers. What a treat! Thank you, Anne. This is so cool. Thank you! I like Goodreads too but a couple things bother me– the inability to journal my thoughts and also the public nature of it. Now that I’m with an agent and more fully invested in the publishing world, I find myself hesitating to rate a book less than 3 stars even if my honest reaction is pretty negative. This is a good way to track since it’s nice and private… (I did chuckle as I saw your example page b/c Bloodroot is one of my favorite books of recent years – ha) Anyway, thank you so much for doing this! It must have been a big project! Oh goodness, I get this. I mostly love but sometimes hate how my star ratings are public. And it’s funny that you mention Bloodroot: I read it because of you! Well, in part. 🙂 It’s been on my list for a while, and then you and another reader friend gushed about it within days of each other over the winter. I could see that Greene was very good at her craft, but SO SAD. Maybe I’ll try again one day. Thank you! This is great. I’m going to put 1 together for each of my 13 yo daughters. Especially with the summer coming up – I don’t want them to fall behind in their reading. This is just fantastic! I can’t believe it’s free. Thank you for the thought and work that must have gone into this. Now to decide on a bound copy or a binder… Hmmm. Also wondered if you could refresh us on some favorite pens to go along with the journal? Thanks! My family loves G2s in general and I personally love Staedtler fine lines, the rainbow ones. Dear Anne, YOU ROCK! I just downloaded and printed off all 53 pages; I can’t wait to get a binder for my new reading journal and start using it. Thank you for such a nice gift to your readers! I love it! Thanks so much, Anne! And what perfect timing. Thank you for your generosity by offering this for free to your subscribers! I love your website and pinterest boards…very inspiring. I’m so glad to hear it! This is fantastic! Thank you so much! Thank you for your generous gift to us! It is beautiful. I love this! Bless you for giving this to us for free. I’ve never seen a reading journal that looks more perfect than this one and I can’t wait to start using it. Thank you! This is terribly generous of you, and looks like you’ve put a lot of work into it, Anne. Thank you! Please send me photos if you do? I’d love to see! I will. It might not be very soon, but I will send photos. I’ve kept a book journal for several years now and have tried several different ones. I really like the looks of yours so I have down loaded it and I’m looking forward to using it. Thank you, thank you! I am one of those constant readers – like you – and I have been using little notecards, like index cards, which of course are all over the place instead of in my book box! This is terrific! Thank you SO much for taking the time and energy to put together this wonderful gift!! I LOVE to read and kept meaning to buy a reading journal, but never quite got there. I am so excited–THANK YOU, again. Just beautiful, Anne! Thank you so much. What a wonderful and great idea.. I plan such a journal over and over again. I was curious how you did it……..but my link does not work :-(. Does anyone has the same problem? Were you previously a subscriber, or did you subscribe in order to get the journal? If the latter, then the link to download the guide is in the second confirmation email. If you keep having problems email me at modern mrs darcy at gmail. WOW! This is such an incredibly generous gift to your readers. (I can’t believe you’re offering this for free!) I want to let you know that your efforts are deeply appreciated. I can’t wait to set up my journal and continue following your blog. Thank you so much! It’s absolutely beautiful! Thank you so much! Thank you, and of course! This is awesome! Thanks so much for making it available, I am printing my copy right now and can’t wait to start! So excited! Thanks so much for all the work you put into this. I know I am responding to a question asked of another user, but… here’s my two cents 😉 I personally would love a full 8.5×11 journal. I always buy the full-size desk calendars and everything else; I generally don’t like smaller things (probably because I write too big, and too much!). So, there you go, FWIW. I’m still definitely going to use your lovely printable though!! Yes! I would love to have the full size! As the other “replier” mentioned, I write big too! A bigger size would give me much more room to write! I love this! I am printing one ASAP! I have been reading on my Kindle for a couple of years but I think I am going back to true books! Your pictures have inspired me to want to hold a book in my hands! Anne! I love this. And oh my, I am grateful in an unexpected way. We recently changed internet companies, and my email address changed. I thought I had unsubscribed and resubscribed to everyone with my new email, but I missed you! I would not have noticed if your post hadn’t said the journal showed up in the last newsletter (boo, I missed it.) So… here I go, resubscribing. I don’t know how to unsubscribe the old email. Sorry. 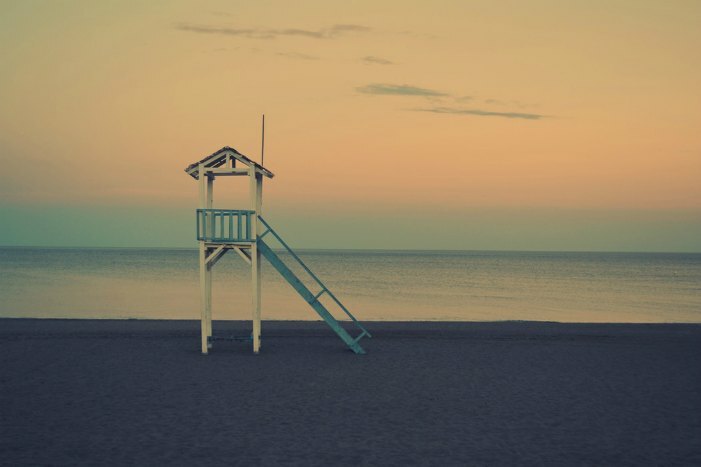 Now… to print this out, go to bed and wake up to the summer reading list! This is amazing!! Thank you!! I think I am going to use this with my kids as well!! I love together projects and was really thankful you included a kids list too! Thank you so much for this wonderful journal. Didn’t realise how much I wanted a reading journal until I saw yours 🙂 want to attach a pic of the journal I made using your printable. Is it possible? Not in the comments, but I’d love to see it. Email me? (modern mrs darcy at gmail) or post it to the facebook page? I LOVE this idea! I too get on Goodreads, and find myself getting distracted online doing other things. I prefer a journal. Only problem is, I am unable to download or print. any suggestions as to what I may be doing wrong? Thank You, Love your blog! After you subscribe you’ll get a confirmation email in your inbox. The link to the journal is in the next confirmation email. This is beautiful; thank you for sharing this. I’m just trying to decide between the looseleaf and spiral bound versions! I’m thinking I’ll add a List of Books to the front along with maybe a page number so I can look up the comments on books already read. Heaven-sent!!! I love love love it!!! Thank you so much, Anne. 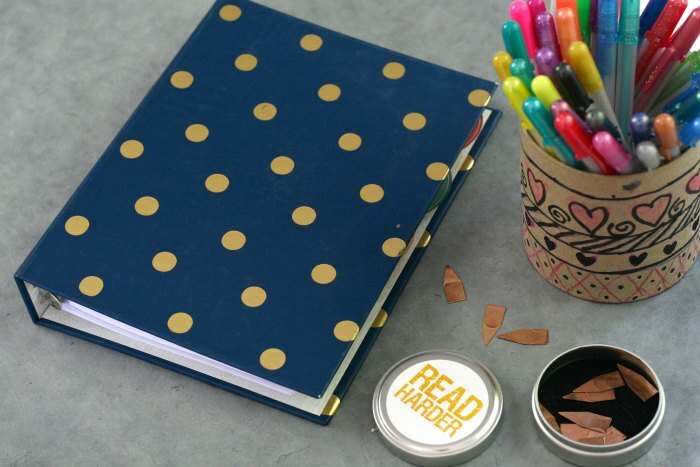 As an avid book-journaler (I don’t regular-journal bc I’m a ‘fraidy cat – but I love me a book journal) I love this! I don’t usually love printables, but you made this so do-able. Thank you! Thank you, this is brilliant. Your generosity is over the top. ooooh, so pretty! and what a great idea. thank you for sharing! I’m trying to find the link to download. I’m now a subscriber but still can’t find the link. This journal would be perfect for my friend and I to share our views on the books we read. I also cannot find the link to download the reading journal even though I am subscribed. Ah, that sounds like a hiccup with the email service. 99.5% go through just fine … but that last .5% is a bummer. Shoot me a message at modern mrs darcy at gmail dot com and I’ll send you the link. Hi! I am also a subscriber but did not receive the download link for the journal. I will email you as well. Thanks! Journal printed! (YAY!) … But my inkjet skewed the lines, so I may be taking the file to get laser printed. (YES! I am “that” OCD! ?) Junior binders don’t come with those neat ‘page lifter/protectors’, darn it!! Office Max cut to 8.5 x 5.5 for me and placed cardboard between the two sections ….. REPURPOSED into the page lifter/protectors (which will be decorated, eventually). I kinda go “all out” for things like this …. Ordered a custom binder cover from Etsy. Could post pics when all completed??? Last, but not least, THANK YOU! for creating the journal!! ???????? Would love to see pictures! Thank you so much! I hadn’t realized how much I wanted something like this until I saw it. Can’t wait to use it! Can you please help me? I love your website and am a subscriber. I must have missed the email where you sent out the reading journal and I would love to download it for my children to keep track of their summer reading. I tried re-subscribing to get the file, but it did not work. There’s a known problem: about .1% of the emails with the journal link get lost in cyberspace. Email me at modern mrs darcy at gmail dot com and I’ll shoot you a direct link. I am a subscriber and had a link sent to me for the journal, but I can’t find it. Can I please have another one? I just sent one to your inbox. If you have any trouble email me at modern mrs darcy at gmail. Hello! I subscribed and am looking for my confirmation emails but I haven’t seen them. I did receive the post on “7.5 Things I learned in July” though! Should I give it a few days? Your blog is quite lovely! Thanks for your hard work! Katelyn, it should have arrived immediately but a small percentage of the emails disappear into the void. Sorry for the trouble; I just sent you a direct link. I would love this journal but cannot see any email with the link to download. I am sorry, I subscribed twice (the second time in hopes of getting the email with the link) but I still can’t seem to see any links. I am getting your posts though, love them and have recommended many times over now. Thank you! I’m sorry! I don’t think it’s you: a small percentage of the follow-up emails get lost in cyberspace, permanently. I’m sending a direct link to your inbox, please email at modern mrs darcy at gmail if it doesn’t show up immediately! Hey Anne, I’m just now getting around to trying to download the journal, but it’s not showing up in my email. I’ve been a subscriber since 2014 and just re-subscribed just in case. Can you email me a direct link? I absolutely love this journal, and subscribed to your newsletter to get the download a few weeks ago. However, my printer was broken. 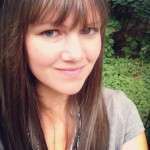 Since then I’ve been slowly working my way back through your archives and am loving your blog! Now my printer is fixed, but I can’t find this file anywhere on my laptop! I’m afraid that I didn’t save it. I attempted to resubscribe to your newsletter, but can’t seem to get that to work today. 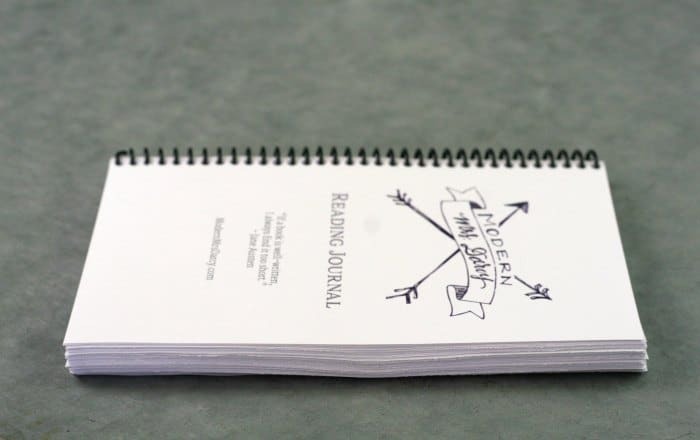 Anything I can do to get a copy of this reading journal again? Yes! Check your email. I just sent you a direct link. Thanks for stopping by, and welcome! I hope you can put it to good use! I look forward to every post! And I often go back on the blog for book ideas….and I ran across the journal in the sidebar. I don’t remember getting the link. Potentially an operator error…me…haha. Could a you please send me the link if you have time. This is a wonderful idea! I live for your reading lists and now will have a spot to put them instead of all those notecards I now use. I’m loving your templates. I, too, would love the link for printing. I don’t see it here on the page? 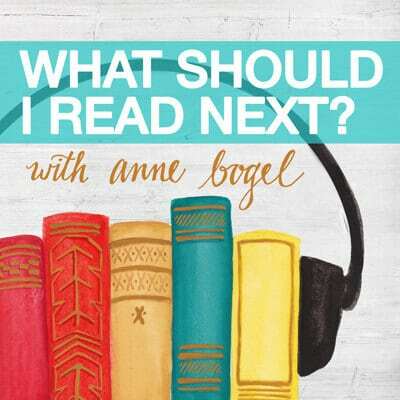 Anne, love your blog and have been following you for quite some and you’ve inspired me to both read more and read things outside my normal sphere. I know I received your email with the reading journal info back in May, but put it aside and now can’t find it either in my email or on my computer. Help! Is there someway I could be sent another copy? I would greatly appreciate it. Best regards..
Anne, can you give me the same grace and mercy you extended to Mary Anne T? I regularly receive your emails but have no idea where I stored/saved/deleted the free download. Hi Anne I too would like a link to get the journal. Not even sure when I signed up but have just been reading about the journal and all the comments and think it would be a fun idea. Enjoy getting your recommendations on books as I hate to pay the price for one and then discover I really dislike it. Thank you! Merry Christmas! Hey, I’ve subscribed to the list, but haven’t received the journal yet. Cannot figure out why. I’m start with the planning process for next year and reading is one of my priorities, so I am looking forward to using this journal a lot. I’m so excited to begin a reading challenge. Hi Ann, I love this idea but I cannot see the link to download the book journal even though I have subscribed. Any tips? Check your email! I hope that works. Thank you so much for this fantastic resource. I have one question, what font are you using for the cursive on the pages? I obviously do not have that font on my computer because it is printing something quite ugly! LOL! Oh no! I’m so sorry to hear it! Anne, I have subscribed, but I’ve not received the link to the journal download. Ordered a binder, etc., but will surely want the pages when the binder arrives! Thank you for your work in putting all this together. The technology gets a little hiccupy sometimes, unfortunately. I just emailed you a direct link. Got it! Thank you! This is great! I am in the same boat as some of the above….I am a subscriber but dont have the link to download. Could I have a link to download it too? I just sent the direct link to this email address. Hope you enjoy using it! Could I please get this? I’d love the link for the journal as well. Can’t wait to get started! No email with the link to the journal. Just curious, what colors are on the cover page? The reason I ask is because when I printed mine, the cover page was black and white with what looks grey maybe? This is a great journal! Thanks for sharing it with us! Hello! Are you still willing to link to the journal? I’m so excited for the 2015 reading challenge!!! When you subscribe it should land in your inbox automatically. If it doesn’t email me and I’ll make sure you get your copy. Hi! I am an email subscriber, but cannot find the link to download the journal. Would you be able to send that to me? I just downloaded and printed it! I love it. Bought a small 3-ring binder today to put it in for the flexibility but the copy place couldn’t punch it for me! I cannot for the life of me find out how to punch this at home other than by hand with a single hole punch. ? Any idea how I can figure spacing for the holes? This is going to be a fun year of reading! Try going back to the store and using their freestanding hole puncher. Make sure you take you binder with you to correctly line up the holes. Copy shops will usually have a hole puncher for public use by their copy machines. I’m subscribed, I checked my email, and I don’t see a link to the journal anywhere. I’m sorry, that happens sometimes with mailchimp. Check your email, it should be there now. Hi! Thank you so much for this. I love the idea of printing my own reading journal! I’ve checked my mail tho, and there’s no journal. Could you maybe send it to me? I stumbled across your journal idea and after wondering around your site decided I just had to subscribe. I really like the idea of journaling what I am reading and this setup is just perfect. I subscribed this morning and was wondering when I might be expecting to get a link to this wonderful journal of yours! I confirmed my subscription but haven’t received it yet. Thank you so much! I am super eager to get started. Anne, can you please share with us where you place your divider tabs in the journal? I love the idea of your book journal but I never received the link to download. Today I even unsubscribed and then resubscribed to see if that would work but it did not. I wondered if you have any suggestions that might help. Thank you for all the time and effort you invest into making this such a wonderful haven for readers. It’s not you, it’s mailchimp. It’s a known (and frustrating) issue that .2% of journal emails get lost in cyberspace and I’m so glad you emailed. Check your inbox; it should be waiting for you now. I absolutely love your website. I started reading your blogs and I have already ordered one of your recommended books by Eleanor Roosevelt – “You Learn By Living”. I shall add that to my goal of reading 30 books this year. Downloading and filling in the journal will be a first for me but I’m willing to try it. Thank you for all of your great suggestions. Glad you’re enjoying it. Thanks for letting me know! Can’t find the link to download the journal…help, please? Thanks! I just sent you a direct link. Check your email! Hello, I’m looking for the link to download. Any chance you can send me a direct link? Thank you! sorry can you send the link to the downloadable journal? Thanks! got it 🙂 Thank you! Download for journal is floating in cyberspace. Please send link. I am so happy I found you! How do you make it in portrait size? I can’t figure out how to do it! The only available version right now prints two “pages” per page, that then get cut in half. Do you know of a printer where you can just upload the PDF and BAM! they send you the printed and bound journal (after you pay for it of course)? I tried uploading it to make a trade book using blurb.com, but it tells me the PDF is outside of the parameters. I’d love to make it really permanent like that. Hi! I´m from Venezuela! Thank you so much for this beautiful journal! I hope to help me organize my reading! I find this for Pinterest and i love it!! Gorgeous site! I’m glad I found it. Thank you for the lovely reading journal. Can you please send me a link to download the reading journal? 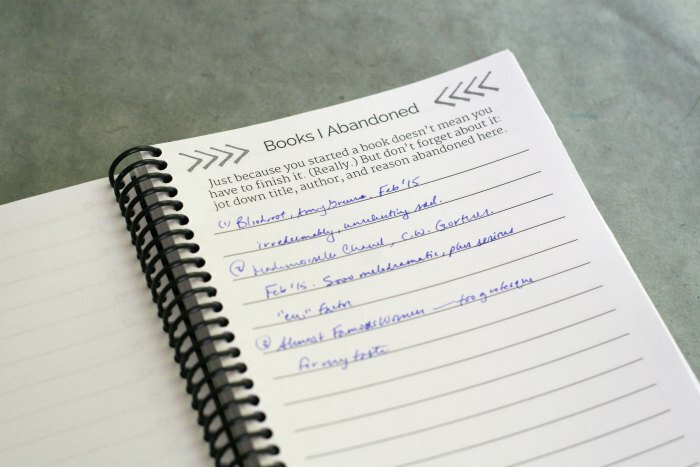 I loooove this idea of a book journal…downloaded! Going to make my own beautiful copy. Thanks for sharing your inspirations, you’ve made my world even lovelier. You have a fan in Kingston Jamaica. I’m a subscriber and can’t figure out how to download the journal. What am I missing? Can you please send me a link to the reading journal. I’m a subscriber but can’t find the email in my inbox. Thanks! Can’t wait to get started. your reading journal is AMAZING and BEAUTIFUL and PRACTICAL beyond BELIEF (a huge compliment in my world). THANK YOU for making this a freebie for your subscribers (I subscribed immediately just to get it, being completely honest here, though glancing through your website made me want to subscribe anyway. 😉 I love it, it’s gorgeous, it’s simple and easy-to-use, and now I want to set it up in a proper A5 binder (I’m in Germany, we do A4/A5 sizing here) with dividers and maybe make another one as a surprise gift for my DH. As a YA author, I don’t get enough time to read with all the research and writing I do, which is a crying shame, considering my to-read list, but this should help motivate me to keep finding 15-30 minutes a day to read. Hi Anne! I’m new to Modern Mrs. Darcy and your podcast and I keep wondering how on earth it took me this long to find you! I love what you’re doing… THANK YOU! I am super excited about this reading journal so I followed the directions to subscribe and I received the email from you with the link to this page and the link to the journal download, but the link to the download is broken for me. I simply get an error saying that the site can’t be reached. Any ideas? Thanks for the kind words, sorry for the trouble, and check your email! I love your site and podcasts! I’m already a subscriber, but would love to have the link for the 2015 reading journal. I need the writing prompts rather than blank pages as in this year’s reading journal. Pretty please? thank you so much; I finally got my journal after it being emailed directly after not being able to get it before; was going to ask you then about the holepunching but see others have as well; not sure my personal one will adjust, but seems both the men of my house – hub and son – have them at work that will so going to see how it goes – trying to remember, maybe should go look but the one you can order, is it bound or loose? I can’t find a link for the reading journal. I already subscribe. Hi Anne! I love your blog and podcast. I’m a subscriber but I must have missed the reading journal. Is there a way you could send it to my email? Thanks! 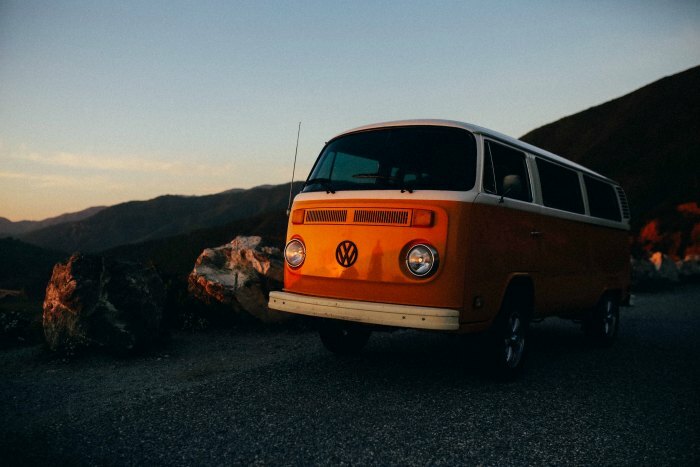 I have been following your blog for some time now and truly enjoy. I have entered your portal to receive the book journal but have not received a message or e-mail back to allow me to do so. Have we overwhelmed your system with our asks??!! Will wait to see when I can access and I look forward to it. I, too, use Goodreads to log and review my reading list but I love pen or pencil and paper. Hi! I love you reading journal and I love your website. Immediately subscribed to i! I should’ve discovered your website a while back! I am already scanning through your old posts and I love it. This will definitely be helpful for me. By the way, I can’t seem to find the download link for the The MMD printable reading journal. Please help. Thank you! I started with it in full form and, like so many things in my life, it got used for awhile and then I lost it (literally — it disappeared for a couple months). When I tripped over it again, I couldn’t seem to get back into it. Not abnormal, either — this happens to me regularly with journaling things. It’s incredibly irritating when I see how many half-used notebooks I have. Then I started a bullet journal. Somehow, SOMEHOW, I’ve kept that going and am even getting my second journal set up for when the first fills in a few weeks. (Yay!) When I looked through the reading journal again, I found that I used a couple parts more readily than others — the lists (easy enough to add to a bullet journal) and the 3-per-page quick summaries. They were the perfect length for me — enough space to get the essentials down but small enough that I had to prioritize my notes. To keep it that easy (and because the reading journal layout is gorgeous), I printed just the summaries on full-sheet mailing labels and cut them apart — 6 per sheet, trimmed so that they’re essentially book stickers to put in my journal as I go. They’re tucked in the back pocket, ready to use whenever I want. Lots of fun for me (whee stickers!) and this also means book notes stand out a little differently from every other note I write. Anyway! That was long-winded. Thank you for putting such an awesomely flexible (and did I mention gorgeous?) journal out there! Thanks so much for sharing a glimpse into your process! I’m a recent bullet journal convert myself which made this especially fun and helpful. Thanks for creating this. So looking forward to getting started with it! I don’t seem to find the link for the journal – would you please re-send it to me in order to jump-start my 2017 reading? I’ve lost the email that contained the link as well. Can You resend it to me please? Can you resend the link? I lost my original and would like to create a new journal. Thank you!! P.S. I love your blog and your podcast! Thank you for your recommendations and the research you put into doing all of this. I never recieved the link to the journal when I subscribed, or didn’t realize what it was and deleted it. Do you mind re-sending it to me? I love my bullet journal and I’m interested in either adding a reading journal to my bullet journal or creating a separate reading journal. Would you mind sending me a link to the reading journal? Thanks! I never received the link to the journal when I subscribed – Do you mind re-sending it to me? Have a wonderful holiday season!! I can’t seem to find where to download the reading journal nor was it in the email? Hey, I didn’t receive the email with the link to download the journal. Would you please resend it? Thank you very much. Pingback: 2017 Binder | 2 – Thoughts From Sarah J.
I would like to get the reading journal printable pages but when I subscribed I did not get the download for these. Is there another link I should use? There is no link for the reading journal on the page. Can you please resend to lwright@nepres.com? Thank you! Just subscribed and after gotten my link for the journal. I noticed several others were asking about it as well. Can you please send it ASAP as I’m organizing for 2017. Your site is beautiful and I can’t wait to dig into it in more detail. Thanks for the great reading kit and looking forward to getting the journal soon! Thank you for the link. I got my journal all set up yesterday afternoon. Looking forward to using it in 2017! Joining the clamoring throng in a request for this download to be made re-available. 🙂 Thanks! I would love the link for the journal as well, please. It’s such a great idea! Thank you! Hey! I got an email, but my kit did not come with all of these pages- did I get something different? How can I get these? (the email I got when I subscribed was great- but it was just a little 4 page document, and I want to do a journal like you have here as my new year’s resolution, so anything you can send me will be a huge help. Thanks! I can’t get the 2017 Reading Challenge. I have been signed up for a while now. Please help. Love this site! Plan to take the 2017 Challege. Can you send me the link to the reading journal? Hi! I didn’t get the link to download the journal either ? Could you please send it again? Thanks and Happy 2017! I did check my inbox for the reading journal, but I still don’t have it. I did get the amazing reading challenge and I’ve started my first book! I went ahead and ordered the reading journal you suggested, since I couldn’t download the other one. My daughter just told me about your site and I am really enjoying you posts! I look forward to reading you in the new year. Happy new year! I’m excited for the reading journal. Thank you. I’m printing it now. I too would love to receive a copy of this via email! Just signed up again for the third time for the reading challenge and as a subscriber. this time I used a different email. But haven’t gotten the reading challenge material or the printable journal yet. Please help! Can’t wait to start the 2017 reading challenge! I’m a subscriber but must have missed this. Can you resend? Gonna share it in my blog(liliswordyplanet.wordpress.com) once I print them. I would love to print off the reading journal however I did not get the email – is it possible to get the link sent again? Thank you! Hi ! I would lovery to get a copy of the journal and was wondering if the link to the journal is still available ? 🙂 Much appreciated! ! I just subscribed (again) for the new year! Can I please get the journal? Thanks! I tried to send it but I got an autoresponse that said “undeliverable: domain name not found.” Help? I’d love a copy too! Do you leave empty pages after each author for their new releases? I don’t, but I know other readers who like to do it that way. I’ve subscribed three times and still haven’t received the journal link if I could get that please? Loving all your articles too by the way. It’s designed to print at 8.5 x 11. I meant I’d like to print at the half size that Anne does. There are so many great 8.5 x 11 printables that I find but have not come across any information explaining how to print for an A5 journal. I would think there are many of us that use this size. You wrote that you cut your printable reading journal PDF in half to create a 5.5 x 8.5 journal. How did you do this? Were you able to print as a 5.5 x 8.5, or did you actually cut the 8.5 x 11 pages after printing? Any assistance you could provide would be greatly appreciated. Many thanks! I subscribed a few days ago and still have not received the journal, am I doing something wrong? If you click the ‘Confirm Subscription’ thing in the email you received, the journal will download itself. That’s what happened to me. I just CONFIRMED my subscription, and I got the journal right at my download folder..Hope this helps.. I made a mistake. I found a link in my email. Thank you so much. I apologize. When will I receive the link for the journal? Looking forward to trying one of the various methods discussed today for tracking my reading going forward. Is there a way I can still get this download? It is not showing up for me. Our book club is a mix of young and older women. When we started our group was small so when there was an event such as a member having a baby, or someone moving away we would ask for a donation from m the members to buy a gift, but now that we’ve grown and so many of the younger members are getting married, births, etc, it’s gotten out of hand and we would like to handle this differently. How do other groups address this in their groups? Thank you for any suggestions! We are constantly having moms have new babies in our group. So we don’t do donations or gifts but instead for each mom we set up a meal schedule (there are a lot of great sites that offer this service for free) and then whoever is available can sign up on the schedule. This helps each mom feel supported and not everyone helps every time. We just naturally rotate. We often have military moms move away. We have a private facebook group and they will often post about items they can’t take and want to sell, and whoever is interested will buy them and we support them that way. Hope that helps, glad your group is growing! I’m so excited to try the journal. I’m emerging from the ‘baby fog’ of having an infant. My little guy is now 7 months old and I’ve got a huge stack of books I’m ready to dive into, and just like Anne said it’s always a struggle to write about what I read, but I’ll regret it if I don’t. I love having summaries of what I read and what stuck out to me. Hi, I would love to show this off at my next book club meeting. When I subscribed 2 days ago, I don’t think I saw the link for the journal. Help, please! Just a tip, in a pinch – you can copy the url for this page and open it in a private browsing window or in a different browser and then put your address in the Subscribe to Updates box and click submit. I got a link to download the journal in my welcome email when I subscribed. You might need to use your spouse or friend’s email address if you’re already subscribed, I don’t know. I haven’t used the journal yet but I have it on my to do list to take it to Kinkos and get it bound for a few dollars like someone else recommended. I’m excited because I’m almost in the middle of a ton of books, I use Google Keep on my phone to take notes but like she said I don’t want to always have my phone with me, or get distracted. I do not see the download for the reading journal. Hope do I get it? I am subscribed to your emails. Thank you. Thanks again for such a lovely gift to your listeners! I am unable to download the reading journal after trying twice. Obviously I am doing something incorrectly. Thus, I will try again, but would appreciate a word of advice from you. Thank you so much for your help! I’ll email it to you! I just downloaded the pdf of your journal and gotta say this,very unique type of journal it is.No doubt that when you have this opened besides a novel ,it will make you write down the things you loved in that novel.Getting My Spiral BOUND Copy SOON…….?? Tip: You need to print the book in landscape layout. You may also need to choose to print in black and white. Help!!!!! I have tried everything to download the journal and I keep getting a blocked message. i just subscribed – can i get the journal please? thank you-love this blog. Found your website while cruising the web tonite. I’ve subscribed, but no email with the printable reader’s journal has arrived. Am I too impatient? I’ll check again tomorrow. I’m looking forward to using the book for my class next year. I hope to get it soon so I can prep it before school is out this year. Thanks! Hello. I have subscribed and confirmed my subscription but have not received the 2nd e-mail with the link to the reading journal. I have checked my junk folder too. Can you please send? Thanks. Hello! I’m a new subscriber and I would like to receive the journal. It’s not on the emails that I’ve been receiving. Could you send it to me? Thank you very much! I have been trying several times to print the journal, but it is not printing the entire journal. I was able to print off the pages with the lines, but that is all that I got. Also, I am having a problem with printing the bookmark with the summer reading picks. Downloaded the journal yesterday. Looking forward to using it instead of tablets. I am a subscriber and would love this emailed to me. Can you please email the journal to me? Thank you! After searching everywhere for the Reading Journal I had in mind, I found yours. And I love it. I downloaded it. Trashed the email. And then my computer crashed. My techie was able to get it up & running again but the Reading Journal file is gone. Would it be possible for you to forward the Reading Journal download again please? I don’t want to be a pest but I really like it. i dont know how to print it!? Help! I got my email and the link showed me the journal, but before I could download it onto my laptop (I originally opened on my phone), an error occurred and it vanished. Now my email links me to the Best Books You’ve Never Heard Of. Can I get an email with a link to the journal? My friend and I both are MMD fans and I wanted to surprise her with a journal for her birthday. Thank you!!! Would I be able to have a copy of the reading journal please? I signed up for a subscription but the only email I received was the download for The best book you’ve never heard of. Thanks!! I promptly printed the journal and had it binded at Office Depot because I like it better compact. Love it and everything MMD. Thank you. Wow Anne, this is SO well thought out! I am running out to get mine printed and bound today and excited to get started using it! Like others who’ve posted, I too like the abandoned books idea. I also love the notes section and all of the wonderful quotes you’ve included. Job well-done! As a side note, I really enjoyed “I’d Rather Be Reading”! I found myself giggling and nodding my head ☺️. Thank you so very much!! Nancy, I just sent it. Thank you so much for sharing this wonderful reading journal. I have received it in my mail. I am from Buenos Aires, Argentina, and as you can imagine a book lover. I have a little question, I would like to print each separate page on an A4 page, how can I do it? Marta, ours is sized for 8.5 x 11 but you’re welcome to play with the file. I hope you can make it work for you! I subscribed to your blog a long time ago, and I subscribe to your podcast as well, both of which I love, but I (think I have) lost my original link to your reading journal! Do you still send it out?